I always appreciate beauty boxes because I get to try out different products without having to commit into buying full-size bottles. It's economical and environmental too, so when I receive my Blackbox - The Beautiful Truth, I was really excited! 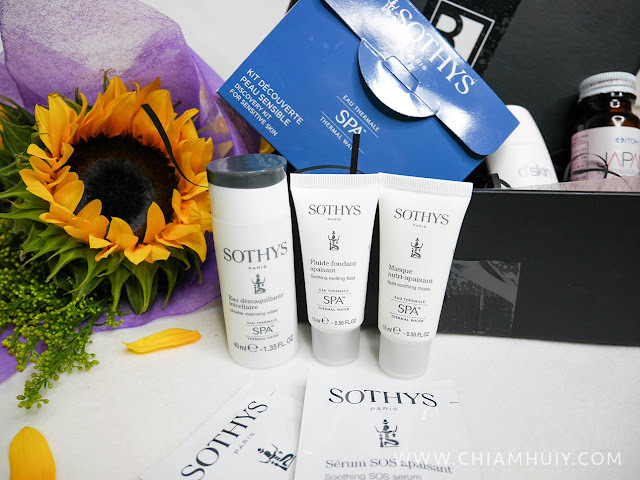 This is my first time trying out the skincare brand SOTHYS. . This kit contains the product range of SOTHYS SOS solution with Spa™ Thermal Water which helps to build skin’s inner strength to balance skin’s tolerance threshold and limits inflammatory reaction. SOTHYS Sensitive Discovery Kit includes travel sizes of Micellar Cleansing Water, Soothing SOS Serum, Soothing Melting Fluid and Nutri-soothing Mask. The SOTHYS Micellar Cleansing Water is odourless and is perfect for sensitive skin. It cleanses the skin with the 2-in-1 cleanser that gently removes face and eyes impurities, and most importantly, leaving no residue and requires no rinsing! It feels just like water. On the other hand, the Soothing SOS Serum is just like how the name suggests, an SOS savior! For something that instantly soothes permanent or temporary discomfort sensations and limit appearance of redness, this is your choice. To my surprise, the serum was milky and slightly more nourishing than other kinds of serum, so I reckon it suits those dehydrated skin more! SOTHYS Soothing Melting Fluid - A daily protection to protect the skin from external aggression and reduce skin discomfort. 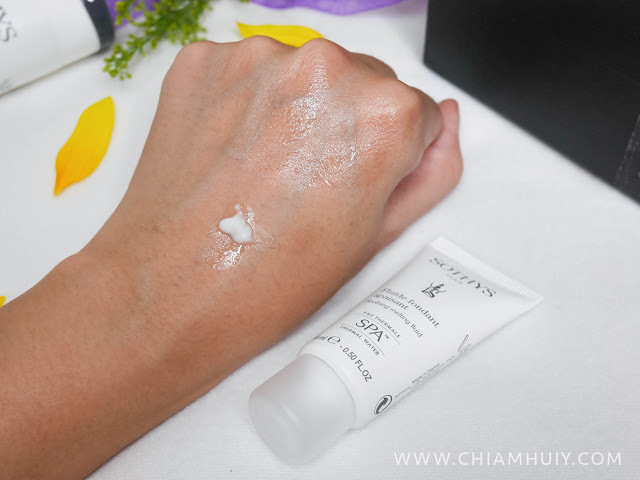 It is even suitable for Sensitive Combination skin. The texture is very lightweight and spread like water. Absorbs very fast too. SOTHYS Nutri-soothing Mask is an emergency care to provide immediate relief to discomfort sensations and maintains the balance of sensitive skin. It has a waxy texture which spreads across the skin like creating a layer of protective wax. It's very smooth and glides on very very seamlessly. 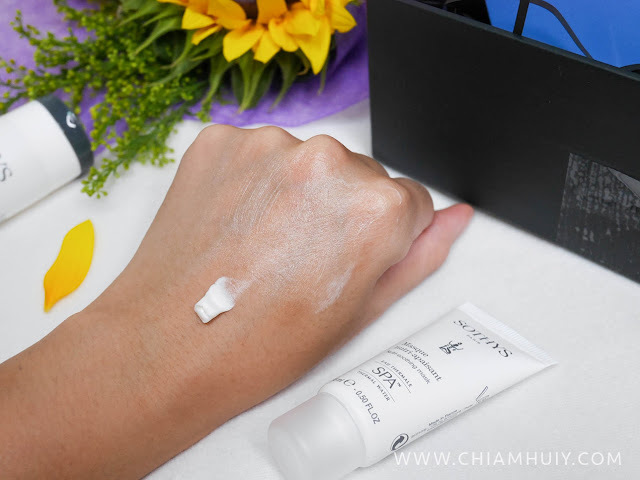 Recently, I've also added in d’skin UV Defense into my daily skincare regime. Strangely enough, this sunscreen is said to have NO LIMITATION to its effectiveness of SPF & PA unless the sunscreen is cleansed from our skin. I am still wondering how it works though, but I'm trusting that this product is protecting my skin against the harmful UV rays. I did a google on this and found that the 'no limitation' aspect is resulted from their patented Y-Titanium (Titanium Dioxide). Ascorbyl Glucoside provides Pure Whitening to lighten and balance overall skin tone as you apply this sunscreen daily. So far, what I think is this sunscreen doesn't make me break out and it doesn't grease up my skin. 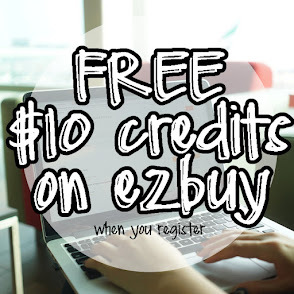 It's pretty lightweight and works great for sensitive skin. It's colourless as well. Itoh collagen isn't anything new to me. 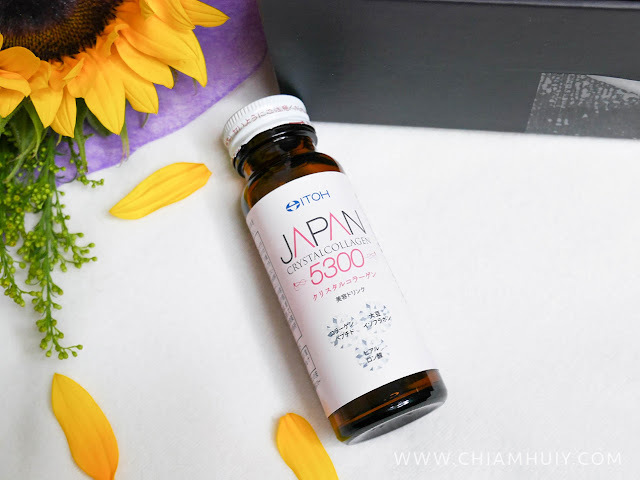 If you are a collagen supplement person, make sure you try out ITOH Japan Crystal Collagen 5300. Keep your body going by making it a routine to drink something good for your health daily! This tastes really good, filled with berry flavours unlike any other collagen drinks you have drank before (which typically has a fishy taste due to the collagen content). The Beautiful Truth Exclusive Pack contains products valuing up to $261.15, but it's now only at $17.90, available from 1 Oct. Honestly if I'm you, I would get this good deal too. For more information, head over to www.blackbox.sg.